Contemporary looks meets innovative design with the return of the Daiwa Infeet series. Designed for the light tackle finesse angler, the new Infeet range features four models, built on hyper-sensitive slow bend graphite blanks. The Infeet’s classic blank is partnered by a contrasting white carbon fibre skeleton reel seat. The exposed design of the reel seat puts the blank right in the angler’s hand to transmit even the lightest of bites. An ultra-thin, tapered EVA rear grip eliminates weight for optimum rod balance and provides that unique modern styling we’ve grown to love and expect from the Infeet range. 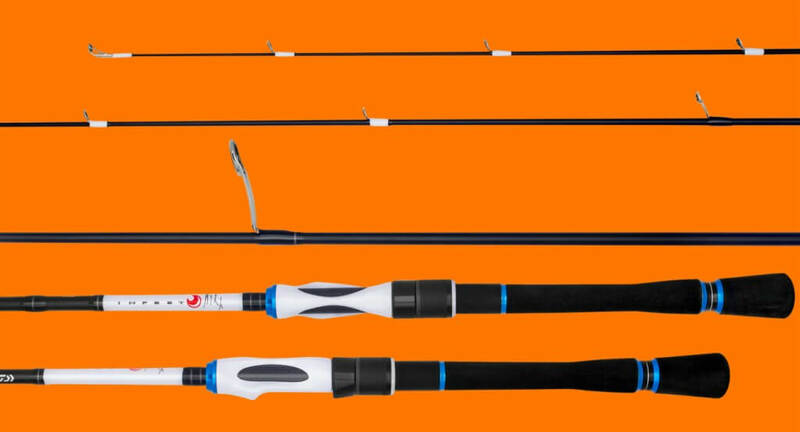 Angler connectivity is further enhanced courtesy of Fuji S/S SiC guides in the base section of the rod, and ultra light Fuji Titanium SiC guides on the top section. The Ti SiC guides lighten the tip of the rod to enhance feel and performance and is indicated by white bindings. A blend of Daiwa’s advanced finesse designs the new Infeet series is state of the art technology blended with precision, performance, and that exclusive Infeet style and swagger.